I tried to persuade myself, to be OK with it all. Nearly two years earlier I had left Los Angeles. For a while I didn’t think I was coming back, but L.A. had something on me and back I came. I washed away the sticky dust under which my car had disappeared and emptied out my storage room. Not much time had passed, but it seemed like a different city. I called a friend who had left shortly after I did. We had seen it happening for years, but it was over now, she told me. The town we had fallen in love with didn’t exist anymore. Our old neighborhood had been altered beyond recognition. Most of the buildings were the same, but the air itself seemed to have changed, the light, the pace of things. I tried to convince her—and myself—that it was OK, that was how L.A. had been for eons: It never stayed still, was in a constant process of destroying and rebuilding itself. That process, flux, was L.A.’s only stable quality. It was L.A., more than the streets or the buildings or the people who temporarily inhabited them. We had let ourselves be fooled and hung tight to a husk the city had already cast aside. I was trying to be Buddhist about it, or just mature. “It’s only change,” I told her. She held her tongue. I wasn’t sure, but I thought I heard her laughing. In the late 1990s, when I moved from Koreatown to Echo Park, L.A. could feel almost pastoral. Every time I drove east on Sunset toward downtown, I passed the Harbor Freeway and looked up. There was a hill on the north side of the street then, between Figueroa and Grand, and much of that stretch of the boulevard had been left undeveloped. “De-developed” might be a more honest way to put it. The houses that had once crowned the hilltops were gone, toppled decades earlier in development schemes that failed to advance past the demolition stage. All that remained were the staircases leading up to empty lots overgrown with scrub. They seemed magical, those stairways, or at least romantic. They hinted at fantastic possibilities—steps to nowhere might lead anywhere—and called out to an otherwise invisible past, one whose violent erasure had been mellowed by time. In The History of Forgetting, Norman Klein wrote about similarly vestigial stairways a few blocks to the southwest. He called them “phantom limbs,” i.e., the kind that continue to ache. In my naïveté I imagined they would be there forever. Of course they would go, too, and quickly did, bulldozed and replaced by developer Geoff Palmer’s Orsini apartment complex, a full, hulking block of faux-Italianate amnesia. So it always had been. Nothing lasted here. There were the earthquakes, famously, and the fires and floods: Until it was entombed in concrete, the Los Angeles River followed no fixed path. Some winters it dropped south to Long Beach, as it does today, but others it shifted west and flowed across the thick and swampy lowlands of what became the Wilshire Corridor before draining into Santa Monica Bay. In the dry months the river disappeared and flowed underground. No trace remains now of Yangna, the native Tongva village not far from where the federal jail now towers over Alameda Street, just like there’s nothing left of Chavez Ravine, or the old Chinatown that was razed to make way for Union Station, or the steep, tumbledown flats of Bunker Hill. The poor have long been pushed aside, especially the ones who don’t happen to be white, their neighborhoods carved and gouged by freeways when not entirely deleted. However ambitious the erasures, something still flows underground. Maybe it’s that something, no matter what fresh mask the town is wearing at the moment, that we recognize as ours. Maybe Los Angeles is not just change, but what we give it: our struggle, pain, and love, everything it appears to eat or discard. 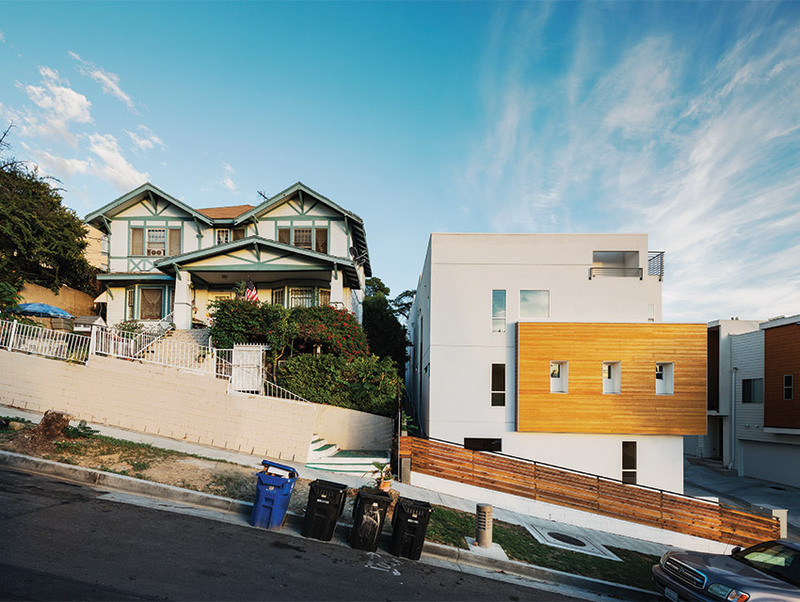 Echo Park transformed in stages, gradual shifts that suddenly tipped as if off a precipice. Then things got frantic for a few months or a year until they leveled out and the cycle repeated. Slowly, for years, the neighbors had been disappearing. The rents climbed at a less gradual pace. The new arrivals were whiter and younger than the people they displaced. Blame me if you want: I was young and white, too. The cop bar on Sunset found new owners, brought in DJs, and started pulling in the aspiring cool from the far corners of the county. Art galleries began sprouting on what had been a quiet block of Echo Park Avenue, a few doors down from a family-run grocery store. A coffee shop opened at the end of the block—the first of what seems like dozens—and the galleries gave way to salons and boutiques and eventually a different kind of grocery, where a single piece of carefully curated fruit can cost as much as lunch. Pioneer Market, which had anchored the neighborhood for more than 50 years, closed in the summer of 2004. That was unthinkable until it occurred. One after the other, both pupuserías—La Fé and La Paz—closed. So did El Carmelo, where the white-haired Cuban men argued at a back table from early morning until late afternoon. For a little while I would see them arguing on bus benches, with no place else to gather. The Mexican bars turned white. The one gay bar turned straight. At some point the stray dogs disappeared—I didn’t notice until after they were gone—and I found myself missing the roosters that I had cursed every weekend morning. Sure, there were fewer shootings, but a different kind of violence reigned, the less obvious sort that breaks up families without a bullet, just a rent hike or a notice from the sheriff in stark officialese. A neighborhood, it turns out, is a fragile thing. Some version of the same process was happening all over: in Highland Park and Leimert Park, Lincoln Heights and Boyle Heights. The city was ravenous. On it spun. For years I had raged about it. It wasn’t just change. It was change of a specific, slanted sort: opportunities and profit for some, the exit door for others. One after another, communal ecosystems were pushed off-balance and then destroyed. Of course those ecosystems had grown in the ruins of past disruptions, taking root as best they could in the disturbed soil kicked up by money as it raced ever forward, disguised, always, as progress. When I moved back to L.A., I avoided the old neighborhood. I lived nearby, a couple of miles away, but it was easier for me. I was trying to love L.A. again, and whenever I went back to Echo Park, I saw something ugly, like the time I passed a Chicano guy about my age ranting at the crowd outside the trendy new café on the south side of Sunset where the old luncheonette had been. Someone had shoved him without apologizing or even acknowledging him, just as none of them were acknowledging him as he shouted and cursed while they stared into their avocado toast. I nodded to him as I passed. His wrath shivered for a second and collapsed, then found itself again and took off where he had left it. I called my friend later that week. By then I was ranting, too. I couldn’t help it. She was nice about it, but she laughed at me.